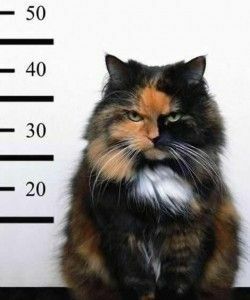 Nebraska Jail Takes Mugshots of Cats! Katie Kramer, one of our professional pet sitters, recently told me that her brother Jerome Kramer, Sheriff of Lincoln County, adopted two cats to help inmates at the Lincoln County Detention Center. He has since been fielding calls from around the Country (even Germany), inquiring about his inventive program. “Nemo” and “Sarge” are the newest inmates, finding themselves in the work-release cell block and the minimum security cell block, looking after prisoners. We’ll do our best to follow-up directly with Jerome after Nemo and Sarge have completed a couple months of their in-house practicum! Good job Jerome! And good job Jail House Cats Nemo and Sarge!